Having competed in 11 Summer Olympic Games, Algeria have won just 14 medals and this year have sent 42 athletes to London to compete in 12 disciplines with a hope of extending that tally. Historically, their best events have been Boxing and Athletics (specifically middle distance running) but Beijing 2008 saw them collect two medals for Judo so who knows what they'll achieve this year. Located on the northern coast of Africa between Morocco and Tunisia, Algeria is home to 37m people. Populated since 10,000BC, Islam was introduced into the country in the 7th century with around 90% of inhabitants now being Muslim. 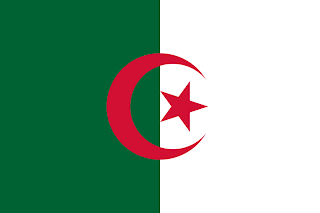 The country gained its independence from France in 1962 and this mix of influences is very apparant in the wide range of dishes attributed to Algerian cuisine. Dishes vary from region to region and make use of seasonal vegetables. According to Wikipedia, all meals use grains. Wikipedia is quite obviously wrong because the recipe I cooked tonight didn't come with grains. It could've done. But it didn't. Geography lesson over, tonight I increased the 'meatball tally' of the Olympic Food Challenge by one meal by choosing to make Keftah. Like so many countries in the Mediterranean, Algerians have a fondness for highly spiced lamb made into either meatballs or kebab shapes. I much prefer the term Keftah or Kofte (Turkish) to the very American meat ball. It's like meat loaf. Stating the obvious but doesn't sound that appetising. My favourite term for meatballs is the German Frikadeller, although I've never tried real German ones. The recipe was once again sourced from t'interweb and I was entertained by its lack of precision. Put roughly this and a bit of that and a pinch of something else together with enough meat to make three smallish meatballs. Great for a bit of experimenting. Meatballs are a popular meal in this house, but if you've read some of my other posts on the subject, you'll know that the husband will only eat Waitrose Aberdeen Angus ones cooked in Rachel Allen's pasta sauce with spaghetti. This is an advance because before this blog, we didn't eat meatballs in this house so it's one extra meal on the menu. But he's poo-pooed all the homemade versions that I've tried. When he found out that Miss A and I were having meatballs, he plastered a pout on his face that would rival Posh Spice. But once he realised they were lamb rather than beef, he was quite happy to sit down to his boring dinner of plain chicken and plain pasta with cheese. Until I put my plate on the table. 'But it's meatballs on baked beans. I'd really really like that' came the plaintive wail. Revealing that the beans were actually chickpeas shut him up pretty quickly and let me eat my very yummy meal in relative peace. As the 'hummus' was so spicy, I didn't give Miss A any, serving her meatballs with pasta and fresh tomato sauce. I did tinker with the recipe a little because I wasn't a fan of the sauce which was basically water with some Harissa stirred in and then reduced. So I added some chopped tomatoes, sea salt and sugar to the mix and garnished it with fresh coriander. Much tastier. The husband eventually stole one of Miss A's meatballs and you could tell from the look on his face that he actually liked it but wasn't willing to admit to it. He can stick to his manky shop-bought ones until he retracts his scathing opinion which was based purely on sight. Served with Khubz also known as Dan Lepard's Perfectly Plain Pita (I adore these and won't ever by shop bought again), it has to be my favourite meal so far and I'll definitely make it again. First gold medal. Mix the ingredients for the Keftah together in a mixing bowl until well combined. Divide into twelve even sized pieces, shape into balls and place on a plate. Rest in the fridge for 30 minutes. Heat a small amount of oil in a frying pan over a medium/low heat. Place the meatballs in the pan and fry until browned and fully cooked through (I popped mine into the oven on 180c fan for ten minutes, wrapped in foil just to make sure they were fully cooked after frying as they're quite large). 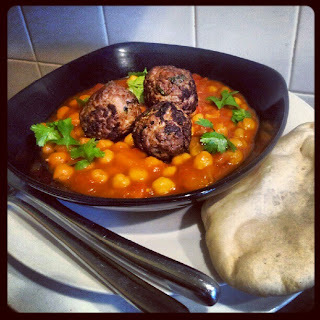 While the meatballs are cooking, place the chickpeas in a small saucepan. Pour in the water, tomatoes, Harissa and simmer over a medium heat for 5 minutes. Add the salt and sugar and simmer for a further ten minutes until the sauce begins to reduce and thicken. To serve, spoon the hummus onto serving plates and top with three meatballs for each dish. Garnish with coriander and serve with Khubz (pita) or rice or couscous.